Treat a man in your life (or yourself!) with old-fashioned luxury. The 4-1/4" brush is made with genuine boar bristle. The heavy stoneware 12-oz. campfire mug can be used for java, too. The Sisters make these 2" diameter shaving soaps to produce lots of smooth, scented lather. The vibrant fragrance of bergamot and fresh basil leaf are complemented by earthy notes of oakmoss and white patchouli. The gift set includes a set of 3 soaps; refill sets of 3 are available. 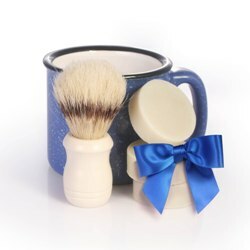 Nice scent, fine brush, good mug and a great shave! Dec 11, 2016 | By Daniel O. My wife bought this several years ago and Im just now needing to replace the brush. I have had to reorder soaps as well. I enjoy these shaving products! I got this kit as a gift for my husband. He was thrilled. He loves ... he can shave without any irritation! One of the best presents I have ever bought for him! Dec 11, 2015 | By Harry H.
A fantastic soap to shave with...!!! !